If I had a nine-to-five job, I would die," says Nirvik Singh, back in Mumbai from a one-day trip to Australia, where he had lunch with a client. “There are some things you can’t do through videoconferencing," he says. As a budding sportsman in the 1970s, Singh realized that virtuosity and variety went hand-in-hand. Playing a different sport each season, he ended up as school cricket captain at Lawrence School, Sanawar (Himachal Pradesh). Holidays at home in Kolkata were spent between tennis, cricket and football at Tollygunge Club and the Calcutta Cricket and Football Club. A gentle bribe of notun gur, his favourite Bengali sweet, and an extra half-hour of cricket, made even the detested but mandatory horse riding, palatable. His father Manmohan Singh was a wealthy Punjabi businessman and sports buff who headed the well-known Pioneer Sports’ outlets out of Kolkata. His mother Meenakshi, from the aristocratic Bengali family of the Malliks, who lived in the palatial Marble Palace in Kolkata, was shunned for marrying an “outsider". But Singh, a favoured grandson, enjoyed occasional weekends there in his own private “petting zoo", with its menagerie of exotic baby animals. Soon, he began playing inter-zonal cricket, encountering the likes of Navjot Singh Sidhu, Ravi Shastri and Mohammed Azharuddin, who all went on to play for India. He played the tennis circuit, too, even as his father dreamt of his son making the national team. In 1980, they travelled to England to watch the historic Wimbledon final where Bjorn Borg lost to John McEnroe. 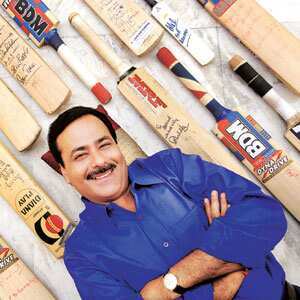 Recollecting those days, Singh says, “It all seemed one never-ending, glorious game." That New Year’s Eve, he discovered that life wasn’t all sport. By the time he returned home from the club after tennis, his father had died of a heart attack. Five months later, his mother died, of heartbreak. And with his relatives grabbing the business, the barely-out-of-school teenager found himself in his Alipore, Kolkata, mansion with 11 dogs and a younger sister to care for, surrounded by beautiful art and dead broke. That’s when he decided his life would be a match, where, he says, “You must play to win. Nobody ever remembers who came second." In 1983, he learnt this lesson anew when he played in the National Championship for tennis against ace player and later India captain Ramesh Krishnan, winning the first set but losing the match. Realizing he would never be among the top five, he stopped competitive tennis. Strapped for cash, at 18 he began his work life as a tea salesman while attending early morning college at St Xavier’s College, Kolkata. And so, “from going about in cars with drivers to taking a mini-bus to office, I learnt how to depend on myself." But giving up a sport didn’t mean the game had ended. Cricketers such as Arun Lal and Dilip Doshi, who played for India, kept in touch; later, Ajay Jadeja and recently, Mahendra Singh Dhoni became good friends. From the tennis world, Nandan Bal, the current Davis Cup coach Enrico Piperno, coach for the present women’s team and players such as Ramesh and Shanker Krishnan have stayed friends. Then, the maternal genes kicked in—the avant-garde Meenakshi had been disowned by her family in 1963 for becoming the first model for the Wills Filter ad. Joining HTA as an accounts executive, Singh fell in love with advertising. In 1989, in a relationship that Singh describes as “just meant to be", he met Ravi Gupta, his mentor and Grey India’s founder-CEO, who later put him in charge of the Kolkata office at the age of 26. In 1994, when Gupta wanted to branch out overseas, Singh roped in old acquaintance, Vijay Amritraj, married to a Sri Lankan. And the former world-ranked tennis player became chairman of Trikaya Grey First Serve, now among the top five agencies in Sri Lanka. Sports continued to punctuate every important turn of Singh’s life. Gupta was passionate about cricket, and Grey’s Colombo office was launched by the Sri Lankan cricket team. In an uncanny replay of the past, however, Gupta passed away from cancer, leaving Singh at the helm of a bankrupt company and without a father figure. Amritraj points out, “Nirvik has always treated his business like competitive sport." Jadeja adds, “He is a thorough professional. I’ve known him to turn down a four-ball with Kapil Dev if he has a business meeting." As before, it was this kind of commitment that allowed Singh to take charge of the situation. He downsized the company by 200 people and got rid of about 50 unprofitable clients. And a sporting relationship—dating back to his school days at Sanawar—saved the day. Singh reveals, “My golfing buddy, also from Sanawar, Gurcharan Kadan of Standard Chartered Bank, gave us an overdraft facility. So, in 2000, we got out of the red, made a lot of money and were fully bought by Grey. In 2004, we became part of WPP globally." These days, as Singh forges Grey’s blistering growth in the Asia-Pacific region, he plays more golf than tennis and watches football, a pastime that cuts across cultures. At English Premier League time, his home turns battle zone; wife Rinita is an AC Milan supporter, his boys are Manchester United fans, while Singh himself roots for Chelsea. And Jasmin Sohrabji, who worked for Singh for 15 years before heading Omnicom Media India, notes, “Way before football and F1 viewership caught on in India, Nirvik had anticipated the trends and passed them on to benefit clients." Sprawled amid his prized collection of signed cricket bats, Singh, a veteran of hard knocks, displays the dent made by South African pace bowler Allan Donald on the bat Sachin Tendulkar used in the 1999 World Cup. Then he reflects aloud: “Twenty years ago, we at Grey were the first to understand the star power of cricket, getting Gavaskar his first endorsement. But now, there’s too much of cricket. I’d like to see football develop, hockey make a comeback. Look at Australia—just 20 million people, they have world-class teams in rugby, cricket, gymnastics and cycling. From being just a cricket-country, we, too, must become a sporting nation." Claim to fame: Turning around “sick" Trikaya Grey, a small advertising agency, into one of the top five integrated communications’ companies in India. Grey India’s campaigns include ‘India Shining’, ‘Incredible India’, Orbit White and Ambuja Cement ads, done during Singh’s tenure.